Digimon: System Restore: Fusion Episode 24: Monitamission Impossible! Multi-front operations have always been fun. When a leader takes the bold step of splitting the troops up, several things happen. By nature, neither half is at full strength while at least one part of the opposition usually is. That requires a certain grittiness to rise to the occasion. The missions often vary, where one is an all-out battle while the other requires tactics, stealth or speed. Flipping between both of those creates a nice pace in an episode. Best of all, when the leader goes for two operations at once, it's impossible for him to be at the forefront of both of them. Somebody else will have to step up. It was a nice bit of planning that put Jeremy in the spotlight of the rescue mission. 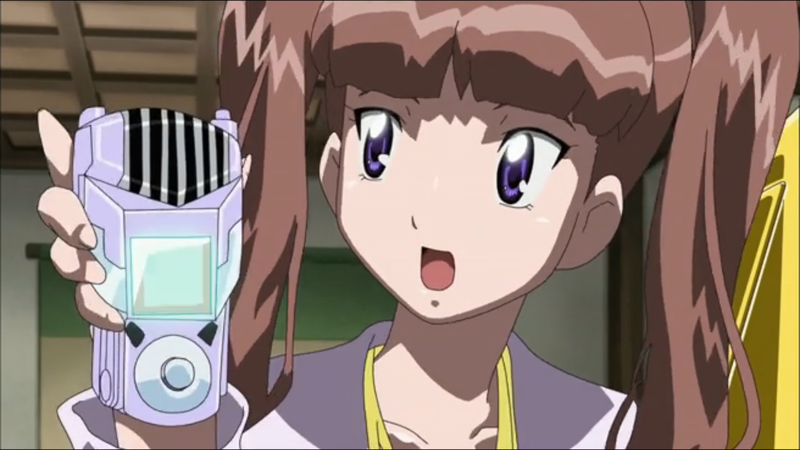 Mikey correctly decides that his digifuse ability makes him more useful on defense, but Nene would have been the slam-dunk choice if she didn't possess the zone's code crown by virtue of all of the prior episode's character development. The reward for her having the stage last episode is what keeps her off it this time. That means either Jeremy has to do it, or Mikey has to send yet another Digimon that could be better served fending off the main attack. We've had plenty of cases where a character perceived as a weak link is forced to step up. They almost never volunteer for it (even then it usually jumps out at them and them alone, like Joe realizing he needed go after Matt late in Adventure). Also, the weak link label is usually more perception than reality. This is a rare spot where Jeremy leaps at the call, and is horribly ill-equipped to handle this job. He can't initiate a digifuse. He can't make a Digimon evolve. He sure as hell can't turn into one. And to make matters worse, he immediately handicaps himself by asking three comically hapless Monitamon to accompany him and Dorulumon. Jeremy's lack of a digivice and the difficulty of his mission makes his adventure as daunting and real as anything we've seen this season. He and the Monitamon struggle with even simple obstacles like swimming and climbing, stuff that most Digimon characters, even small children, seem to be capable of with ease. Yes, he has the very capable Dorulumon, but he doesn't have any control over him. In fact, Dorulumon begins to take charge, showing no patience for amateurs that don't know what they're doing. Nobody on these kinds of missions gets this humiliated, and nobody gets to redeem themselves in such a personal way. How impressive is it that he actually takes his sword and defeats Kotemon by himself? It's not the first time he's wielded the sword and it's his primary positive characteristic. But before it had always been as a part of the mass brawl against the cannon fodder (much like the fight on the other front). This is a short, intense fight, but it's against a Digimon specializing in kendo. Managing his fear of heights and standing his ground against Musyamon are nice, but they don't break new ground. 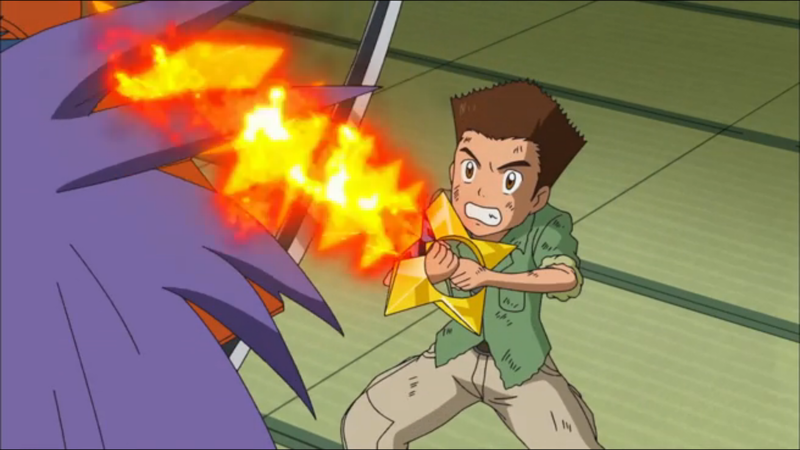 Taking out a Digimon is Marcus-level stuff from a decidedly non-Marcus-level character. Unfortunately, once again Mikey is mandated to deliver the finishing blow. This time it's especially annoying as they have to work really, really hard to put Musyamon on a plate for Shoutmon X5. This despite Nene getting to play the big damn hero for once, snapped into action my Jeremy's heroics. Despite Nene getting a shiny new Fusion Loader and the renewed digifuse powers that go with it. Despite the episode (the whole zone really) being about the supplementary members of the Fusion Fighters. And yes, despite the fact that with absolutely no fanfare or acknowledgment, Dorulumon took down a freaking Deva with one shot. There's some nice comedy potential in Musyamon's attacking army recognizing the “made you laugh” gimmick of the zone. Despite them looking like no-nonsense toughs, they proceed to make the alleged code crown holder laugh. On that note, Mikey should have put Nene into hiding for that battle. Come to think of it, rather than Nene giving Mikey the code crown in an awkward, “not sure if we should be shipping this” moment, it would have been much more fun if Mikey had made her laugh and accidentally won it off her. Then you can cue the “it's all right, keep it” moment. When Dorulumon surveys the entrances, he decides against using any of the main gates because they're guarded. One of them is Kotemon and while it's impressive that Jeremy took him out, Dorulumon could have done so easily and efficiently. Jeremy makes reference to needing to adjust a Monitamon's vertical hold. This season had been doing such a good job making jokes incorporating modern technology and then this. As if Jeremy has ever had to fiddle with the vertical hold on a TV. Is it me, or is Nene's Fusion Loader transformation sequence a little off? It's not quite fanservice-y and not quite shoujo, but it seems to touch both bases just a little. Finally Jeremy gets his badassery in.Now its time for Mikey's mediocretey and Angie serving little to no purpose yayy. With Jeremy's earlier reference to dial up and now a comment about vertical hold, I can't help but form theories that he's a time traveler.